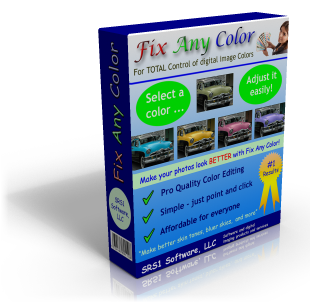 "Make all the COLORS in your digital photos look absolutely PERFECT..."
Fix Any Color lets you selectively adjust colors in your digital photos. It combines sophisticated L*C*h* color processing and fuzzy logic technology with an easy-to-use interface. Simply click on the color to fix, and then adjust the lightness, saturation and hue of that color. Before/after live views of your photos are always displayed so that you can easily see the results of your edits. With Fix Any Color, your digital photo colors can exactly match, or look even BETTER than reality (greener grass, more tan skin, or whatever else you want). Pro photographers use this kind of selective color editing to make their photos look absolutely perfect. With Fix Any Color, just about anyone can now make improvements like these to their photos. Main window - This is the main Fix Any Color interface. The original and final images are always displayed side-by-side. This makes it easy see exactly what color changes you are making. Demo Video - This video shows how to change/improve the colors in your photos with Fix Any Color. To demonstrate this, we change the color of a car in one image. In another portrait image, we improve the skin tone and make whiter teeth. Flash Tutorial - This Flash tutorial shows you how Fix Any Color works, and demonstrates how Fix Any Color can change the color of an object in an image. It shows a little bit more detail than the video, and lets you proceed along at your own pace. adjust the hue from yellow/green to pure green. Yellow/green is about a hue value of 100 degrees, and a more solid green is a hue of about 130. Therefore, a shift of about +30 hue degrees is probably what you want. Saturation (C*) shift --> Increasing the saturation will make snappier greens as well. Possibly +10 C* should help, but you can try different amounts of increase and see what looks best. (7) How can I make flowers look better? Digital cameras are notorious for not being able to capture the full range of colors when photographing flowers and other highly colorful things. To fix photos of flowers with Fix Any Color, click on the flowers in your image, then increase the color saturation by moving the color saturation slider to the right. Try increasing the saturation by different amounts to see what looks best for your image. You can also try changing the hue of the flowers (e.g. to turn a yellow rose into a red rose) by moving the hue color adjustment slider. (8) How can I make skin tones from my digital images look better? To fix this, adjust the hue toward red/yellow and maybe increase saturation a little. To fix this, increase color saturation. A slight decrease in lightness (L*) can also help. Simply make a small adjustment of hue toward yellow, slight decrease in lightness and a larger increase in color saturation. In under a minute you can get any tan that you want. Other Minor Improvements - Other various minor improvements were impelemented.